Too much refined sugar (in sweetened drinks, cakes, biscuits and candy) and saturated fat (from dairy products, cold cuts and meat) throws lipid metabolism out of kilter. People grow fat and then find it difficult to lose the excess weight. 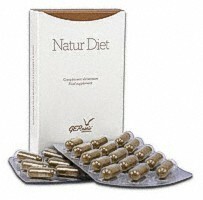 NATUR-DIET: FOOD Control reduces appetite and promotes intestinal flow, thereby synergizing with GERNETIC Int. to restore ideal body weight (according to your morphology) within a reasonable time frame. Based on "hunger-killing" plants like ispaghula, konjac and virgin tea, and supplemented with magnesium, FOOD Control suppresses the appetite and stimulates lipolysis at the same time as it curtails the absorption of ipids and carbohydrates in the intestine.